Approx. 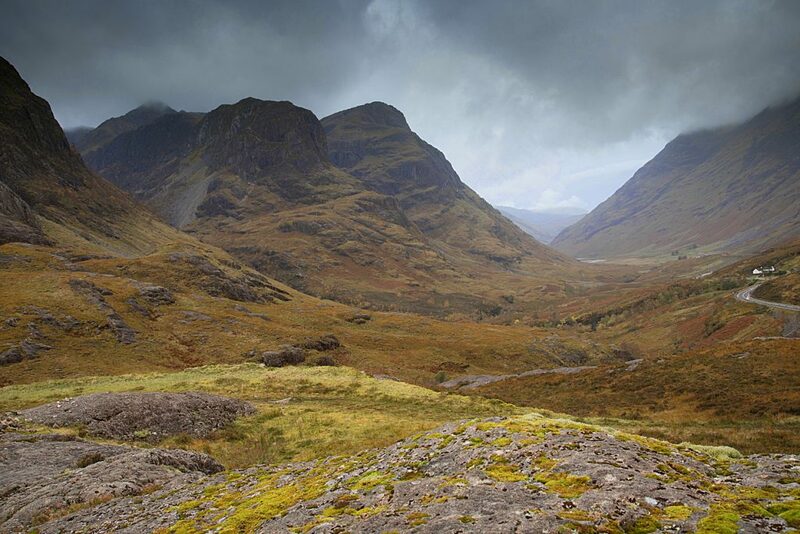 13.30 the Van entered Glen Coe. The First thing that I noticed was the abundance of small waterfalls coming down from the Mountains. Water was running everywhere. Our location for the next 5 days was the Glencoe Inn, only a couple of miles away. In my head I heard the song “Chì mi na mòrbheanna” ( I see the big Mountains) by the Rankin family, so perfectly depicting the feeling that I had seeing this beautiful scenery. My journey had started that morning at 05.00 at Schiphol Airport, where I met the rest of the Group. We were going on a fototrip to Glencoe in Scotland, organized by “Nordic Vision”, a small travel agency specialized in fototours. 7 enthusiast photographers and a professional photographer as tour leader. On the way to the airport the Taxi driver remarked that I was obviously not going to Scotland for the nice weather. I replied that I indeed did not expect sunshine, but that the worst thing that could happen was a week full of rain and plain, solid grey skies. Exactly that seemed to be going to happen when we arrived at Glencoe. 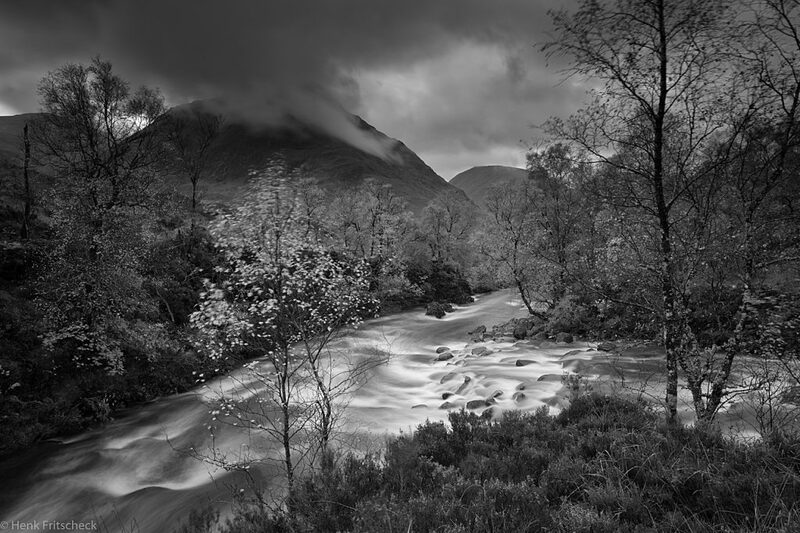 Next morning, we headed first thing to the photographic hotspot in the Glen, which is a waterfall in the River Coupall with the Buachaille Etive Mòr (Gaelic for “big shepherd of Etive) as a backdrop. 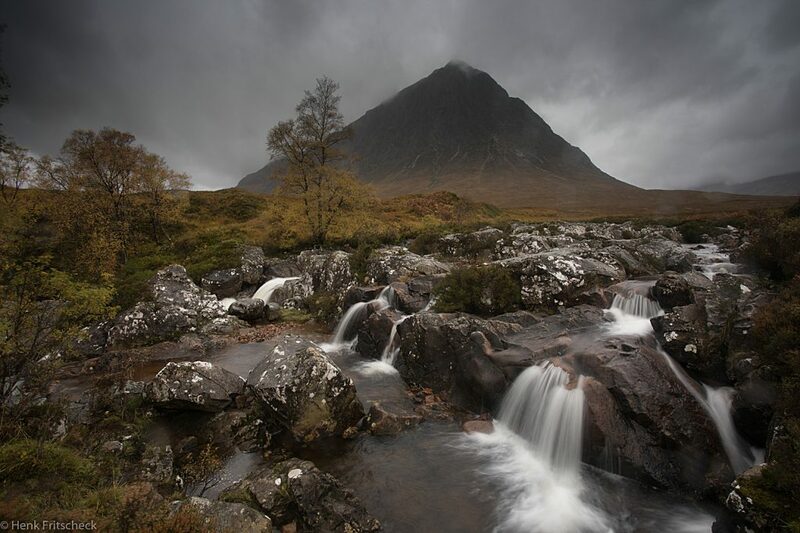 The highest peak of the Buachaille Etive Mòr is the Stob Dearg (Red Peak). Here pictured with its top covered in fifty shades of grey. The waterfall itself was very wild due to the heavy rainfall. 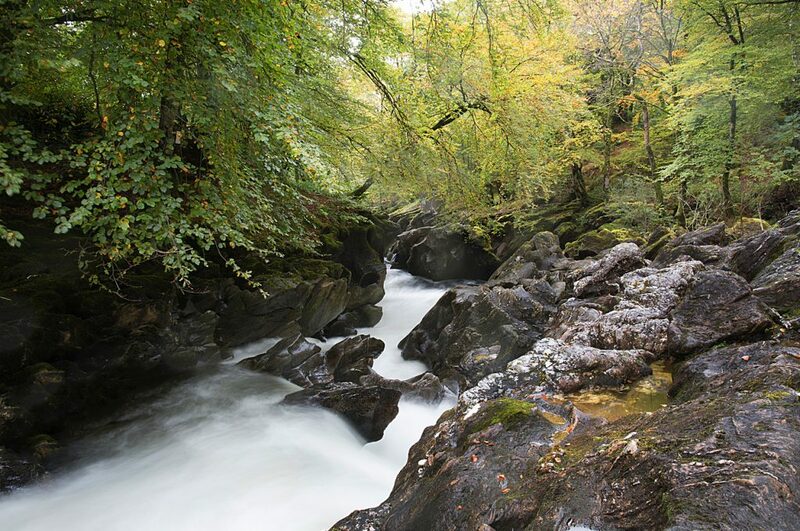 A not so common spot was a few hundred meters away, where the River Coupall meets the River Coe. The autumn colours were very nice and gave me some good Photo opportunities, both in colour and in black and white. By this time there was a desperate need for hot coffee and went to the Glencoe mountain ski resort. There was a big film crew on the parking lot with many trucks. Apparently a movie was being shot for Netflix. We had wondered all morning where the heavy traffic came from, this was the answer. After the coffee we went for Rannoch Moor. 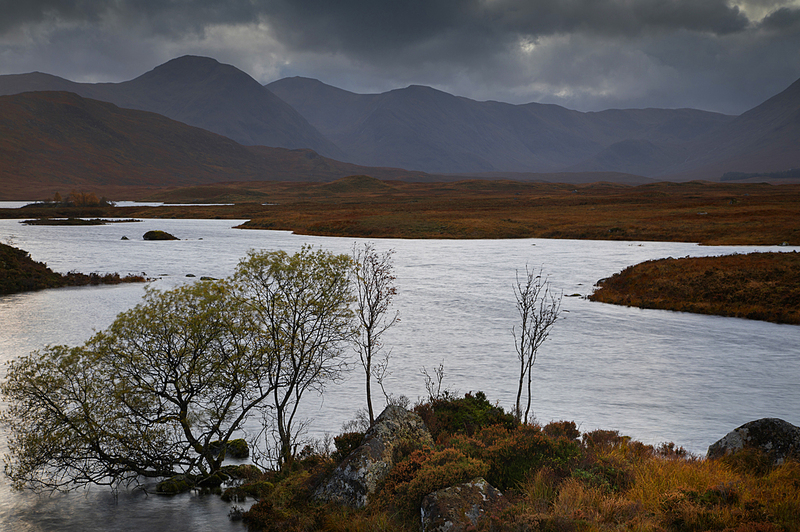 Our photo target was Loch Ba. Loch Ba can deliver some nice pic’s of a tranquil water surface with nice reflections of the sky or some bullrush with background lighting. None of this today. Again due to the heavy rainfall the water level made the rush invisible, and the wind was dealing with the reflections. 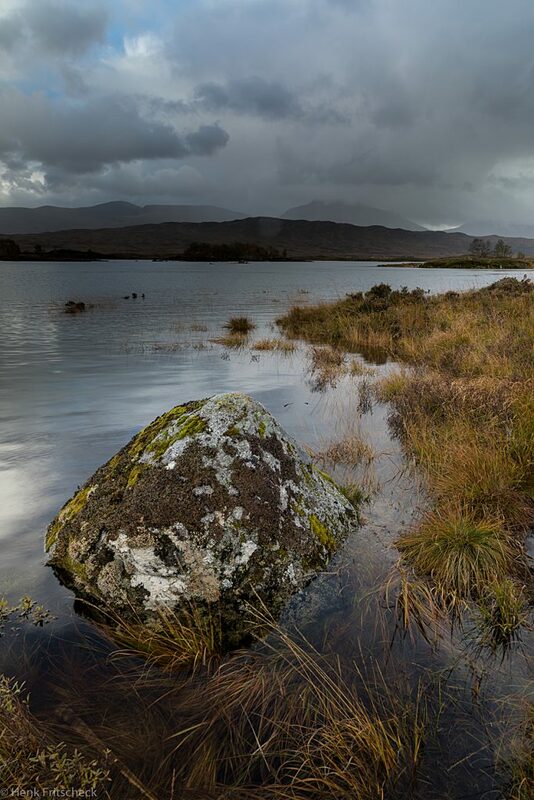 So only one picture of Loch Ba. 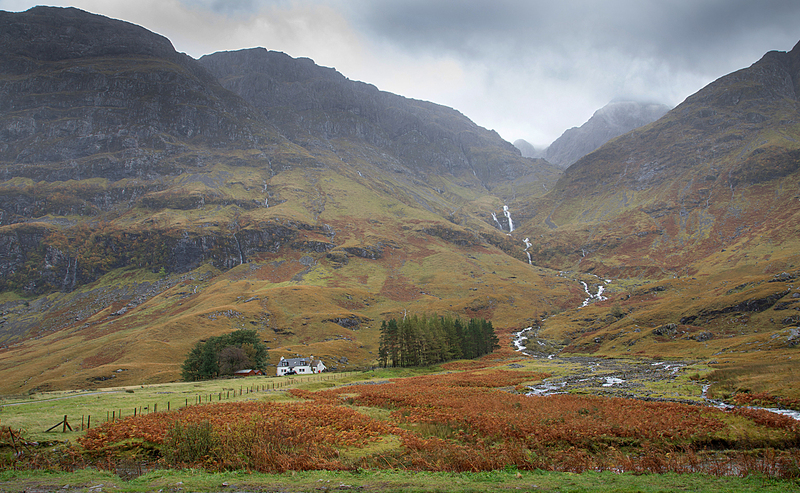 The A82 is the main road from Glasgow into the western Highlands. Lots of lorries and other traffic. 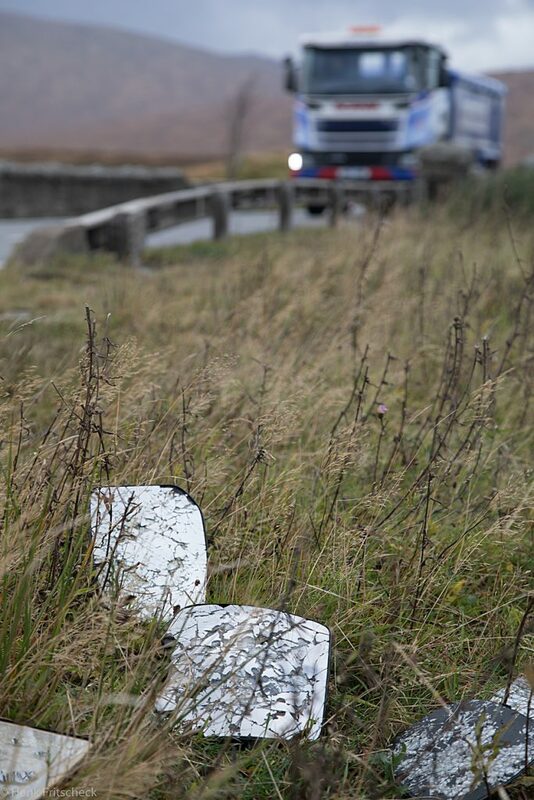 Obviously the road was not built with the lorries in mind. Some of the bridges were too small for two lorries to pass, as a result broken mirrors everywhere. It took me only 5 minutes to gather 5 or 6 mirrors. On Thursday we went to another well known place, Black Rock cottage. The rain had changed from a drizzle into a real downpour and wiping our lens was hopeless, as the rain came almost horizontal towards us. So wiping, a quick picture and then the lens was full of raindrops again. 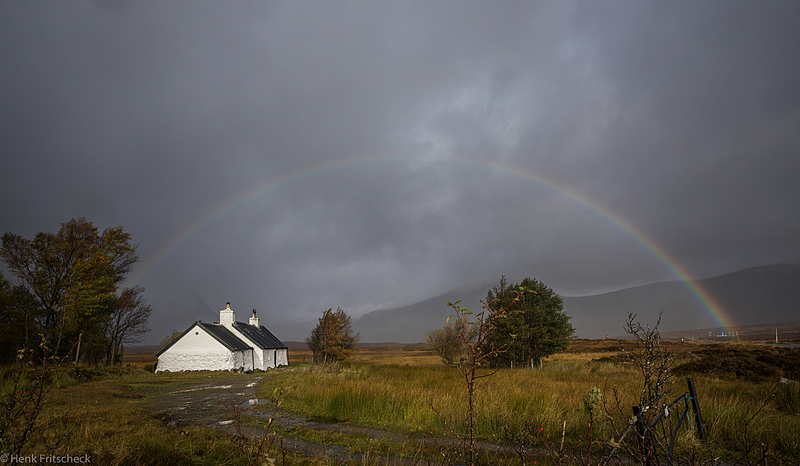 I had no high hopes for the photos of Black Rock cottage, but a sudden rainbow was an unexpected bonus. Notice also the Mountains behind the cottage in the next pic and compare them to the one with the rainbow. No Mountains visible…. Not mist, but low hanging rainclouds. 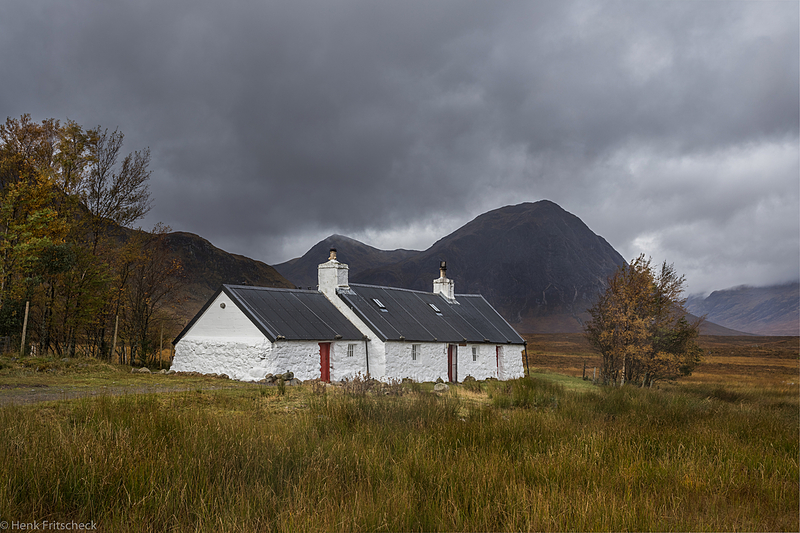 The (in)famous Glencoe weather. Our coffee spot this morning was Kings House hotel. 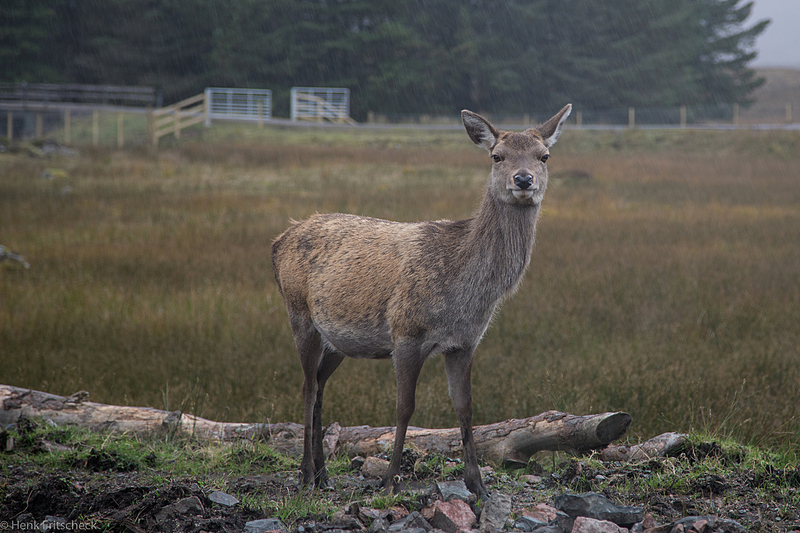 Raymond B, my Scottish friend did send me a pic of a deer that he had taken there and indeed, a small Group was also present this morning. I think the innkeeper feeds them, not scared by us at all. Our next stop would have been the Three Sisters, but that would have meant photographing straight into the rain, so a slight change of plan. Wilco had marked a nice space in the woods near the village and there was some shelter from the trees. 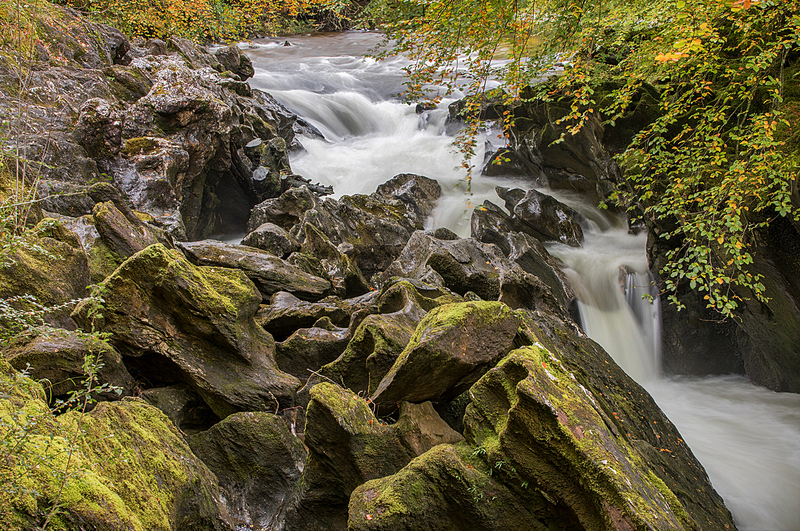 This turned out to be a very good place to take some nice close-ups of the wild stream. This is the moment for a small intermezzo and telling about another thing here in Glencoe. That is the Glencoe massacre. It happened early 1692. The Clan MacDonald had given hospitality in their homes to the Campbell’s. Early in the morning, the Campbell’s slaughtered their hosts. Women and children escaped into the Mountains, where they starved and died of the cold in the harsh conditions. 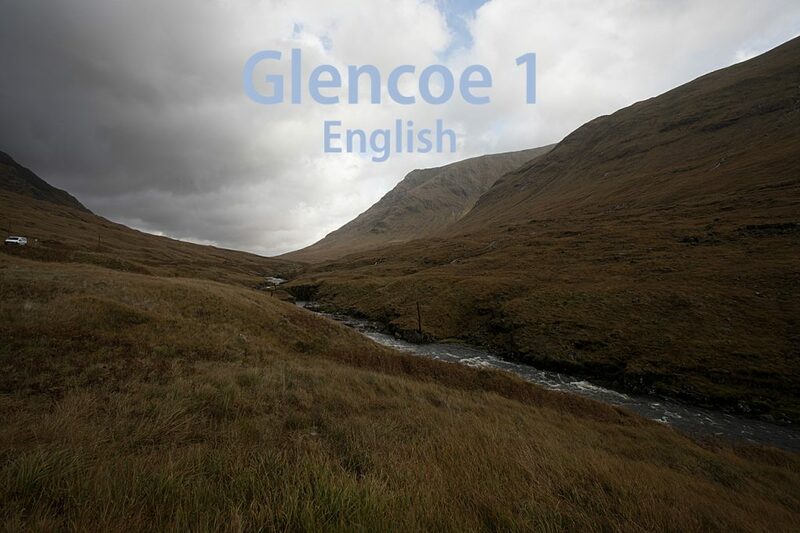 The reason for what now is called the Massacre of Glencoe was that the MacDonald clan did not swear loyalty in time to the new Protestant monarch, William the III. Also more background on the massacre, the songs etc by the link above.